Please click here for Word Play Weekend Challenge. Here is another card I created over the last few days using one of Whimsy's June release digital stamps by our new artist Kathryne of Stamp Art Design. Isn't this image just the cutest!! The image is called "polar bear cub - melt my heart". It has been colored with prisma and derwent coloursoft pencils. I distressed all of the edges. The papers are from Stampin Up, Neenah, and designer paper from DCWV. I don't know what happened, but this started out with the sketch from Mojo Monday (last week), which was clean and simple. Somehow i kept adding to it and now it's nothing like CAS. Oh well, I do like how this turned out. The sentiment is from a retired SU set. Wow, so many challenges I was able to combine with this one! A huge thanks to Feline Playful for making it so easy to combine! That's all I have for today. Have some housework to do this morning, then later we are taking the kids to see the new Cars 2 movie. Should be a fun day! I'll be back tomorrow with my new Digital Tuesday card. Hope you'll check back! Awww how precious. Love that image and this blue color is spectacular. Such a cute card. Thanks so much for joining us at Speedy's Friends Challenge this week. I love coming to visit and see your work! Super! Great take on the sketch my friend. Thank you for playing with us at The Pixie Cottage this week. Aww, what a precious card Ellie, love your colouring and the great layout. Oh, this is so cute!!!! I love polar bears and this image is just adorable! Great job! Thanks for playing along with us at Speedy the Cat's Friends challenge this week! This is such a pretty card. Thanks for playing with us at Going Grey with Scrap-Creations. Hi Ellie, This is so adorable.I came her from Susan's blog Stampin Kat. She gave you a Sweetest Award and I wanted to come and meet you. I am a new follower and so happy I found your blog. How pretty is this! I'm all for blue and adding such a cute image is an extra plus. Really great card! Thanks for joining us at MMCS challenges this week! Hugs! Oh, such a sweet card, Ellie! Thanks so much for playing along in our Stripes and/or Plaid challenge at Meljen's Designs this week! 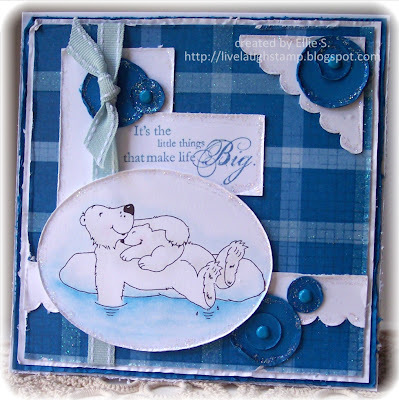 awwww, very cute and wonderful colors to choose for an arctic theme. Thanks for playing with the Friends of Speedy the Cat. Good Luck in the drawing this week. Lovely card! Thanks for joining us at Challenge up your life! I love your sweet card! Thank you for joining our Stripes and/or Plaid challenge at Meljen’s Designs. What a great card, love this one, thanks for sharing with us at HCTB's challenge. Love it all and the lovely ribbon detail!